The Paramount series wall mounts provide versatile and multi-functional features. With PF640, a low-profile design positions the display just 1.26" (32mm) from the wall. The Hook-and-Hang system offers easy, one-person installation of the display. The Easy-Glide adaptors hook onto the wall plate for a quick, simple, and secure installation. 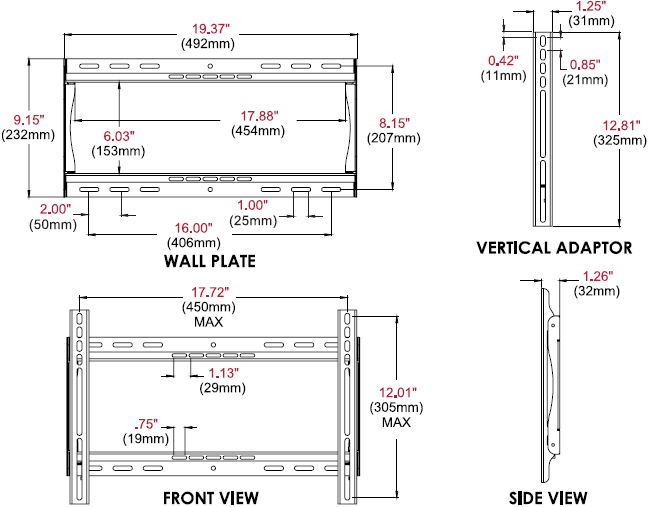 Achieve perfect positioning of the display with the side-to-side adjustment after installation. Helpful Hints: The PF640’s design positions the display just 1.26" from the wall, perfect for almost any low-profile application. Landscape to portrait mounting options increases installation versatility.